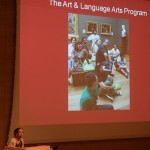 On Saturday, April 20, we celebrated our 13th year of graduates from the Art & Language Arts (ALA) program. We spent the afternoon being inspired by teachers who now give their students more opportunities to be creative and to discuss works of art critically. 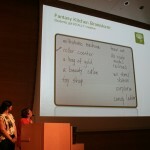 We were captivated by contemporary artist Alexandra Grant’s text-based work. 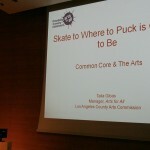 We learned why we should be excited about the Common Core Standards, thanks to Talia Gibas, manager of Arts for All. 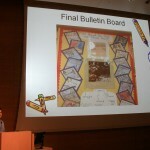 And we were greatly impressed by the ALA class of 20122013 and the work of their students! Congratulations to participating teachers from Carlos Santana Arts Academy, 42nd Street Elementary School, Jaime Escalante Elementary School, Robert F. Kennedy Elementary School, and Woodlake Elementary Community Charter School! 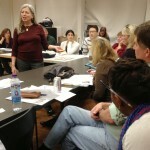 Museum educator Theresa Sotto congratulates teachers on another successful year of the Art & Language Arts program. 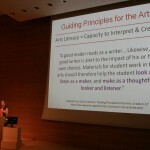 Contemporary artist Alexandra Grant describes how she incorporates language into her work. 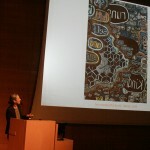 Sometimes the words in Grant’s work are written backwards to teach us the “difference between seeing and perceiving,” as a student once observed about one of her paintings. Is there a better word to place on top of a house? 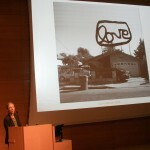 Alexandra Grant describes her Love House project. 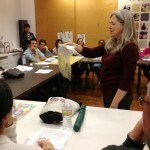 Talia Gibas, Arts for All Manager at the Los Angeles County Arts Commission discusses connections between arts learning and the Common Core standards. Great news! 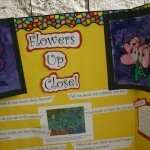 Teachers in the ALA program are already teaching the Common Core standards without even knowing it. 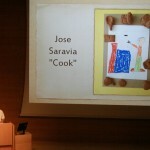 Third grade teacher Raymond Little presents on his lesson on workers in the community, which was inspired by depictions of workers in the Getty’s collection and a sculptural sketch for a fireplace overmantel. 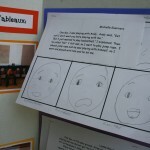 First grade teacher Daniel Santoyo describes how his students learned about lines through a drawing by Vincent van Gogh and about color through a painting by Claude Monet. 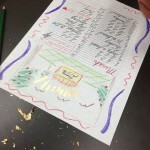 Students at Woodlake Elementary Community Charter Community School dreamed up elements of their own fantasy kitchens, part of a creative lesson by art teacher Sonia Faye and first grade teacher Diana Bosworth. 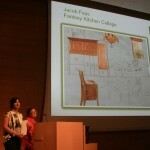 Students created kitchen collages after discussing a kitchen depicted in a photograph by Alex Harris and a painting by Frans Snyders and Jan Boeckhorst. 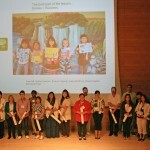 The Art & Language Arts Class of 20122013! 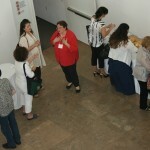 Participants enjoyed our reception of baked brie, lemon bars, and lemonade. 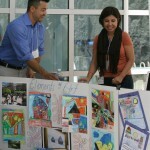 Noelia Moñarrez and Daniel Santoyo set up the displays for their lesson plans. Look at all that color! 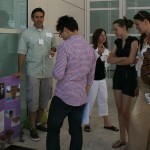 Teacher Bill Steffes describes the sculptures that his students made. 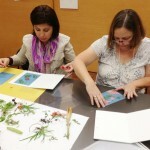 Teacher Blanca Serrano used Van Gogh’s Irises as the basis for an art lesson on flowers. 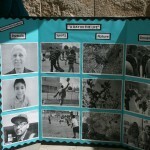 Teacher Will Covely organized a contest on his students’ photographs, and analyzed the winning photographs with his class. 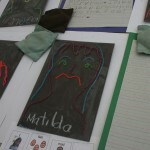 Expressive portraits can be created with so many different kinds of media. Curvy lines in key places can evoke a range of emotions. 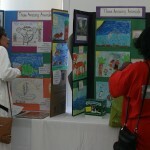 Participants admire the colorful animal drawings of the students of Donna Massenburg and Judy Matsumoto at 42nd Street Elementary School. Where are the people in Pierre-Auguste Renoir’s La Promenade going? 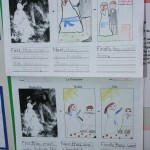 Karen Lee-Park’s students come up with imaginative possibilities. 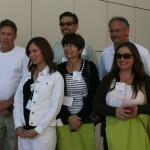 Congratulations to the second cadre of teachers at Carlos Santana Arts Academy who completed the ALA program! 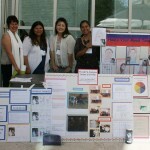 Teachers at Jaime Escalante Elementary School pose with the evidence of their hard work and achievements over the past year. 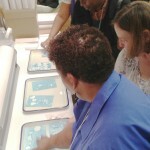 Teachers in the Art & Language Arts class of 20122013 convened early this year to explore connections to the Getty Museum’s manuscripts and photography collections. 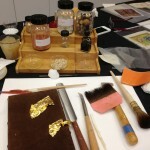 Artist Sylvana Barrett shows teachers sheets of gold leaf used in illuminating manuscripts. Tiny bugs called cochineal that feed on cacti are crushed to make a vibrant red pigment. A manuscript illuminator’s tools of the trade. 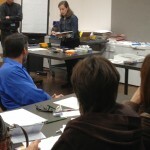 Museum educator Kelly Williams demonstrates how to create elementary-friendly manuscript pages. 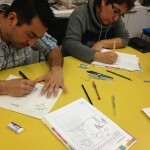 Ethel Bojorquez and Daniel Santoyo are focused on creating drawings for their manuscript pages. 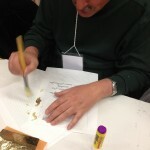 Teacher Raymond Little brushes off excess “gold leaf” from his page. 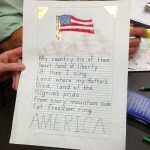 Choir books in the Getty’s collection inspire illuminated lyrics of patriotic songs. Important days on a modern-day calendar are marked in red, just like in medieval calendar pages. 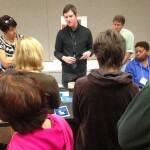 Museum educator William Zaluski describes the process of creating cyanotypes. For their cyanotypes, Sonia Faye and Tan Pratontep select from among natural objects, just as Anna Atkins and Anne Dixon did in the 1800s. 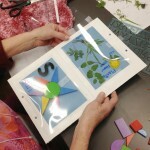 Teachers from Kennedy Elementary School arrange their objects onto light-sensitive paper. 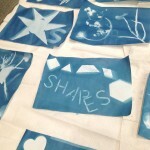 Foam shapes and objects from nature were used to create pairs of cyanotype prints. 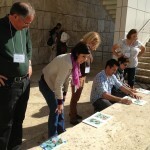 Teachers wait for their cyanotypes to be exposed to the sun. All you need is a tray of water to develop these prints! 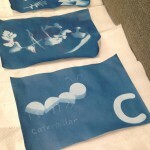 How do you make a caterpillar on a cyanotype look three-dimensional? You let the shadows of wooden shapes leave imprints onto the light-sensitive paper! S is for “star” and for “shapes.” It also stands for success! 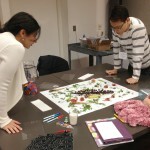 Elementary teachers get creative during the 2012 alumni event for graduates of the Art & Language Arts program. 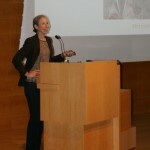 This year’s event on Saturday, August 11 focused on the theme of “Creativity & Innovation.” With the inspiring words and works of artist Mark Bradford and poet Douglas Kearney, and the creative spirit of the participants and Getty staff, we discovered a whole slew of innovative, meaningful ways to bring art into the classroom. Learn about the day’s activities and view more images of the 2012 Art & Language Arts Alumni Event on Flickr.